As a continuation of the Thorn of Humanity series, I presented another illustration of the greatness of Christ as revealed by thorns in the short story of The Nightingale and the Rose. This short story was written by Oscar Wilde, a Romantic writer from the late 19th century. In short, the nightingale overhears a young man's angst over a lady as he laments the fact that he has no chance to dance with her for lack of a red rose. Determined to facilitate true love, she sets out to find a red rose for the young man. After some searching, she finds a red rose bush. The only problem is that the bush is not flowering. In fact, the only way to get a red rose was to make one. The nightingale must sing her most beautiful songs all night long with a thorn puncturing her breast. It is the blood that gives the red rose its color. 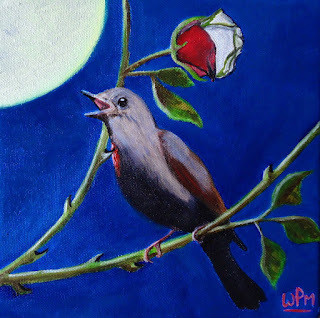 The nightingale gives her life to create a rose for love.